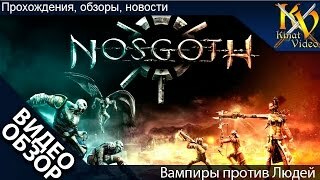 For those who adore the plots about vampires, a network team game Nosgoth has been created, where everyone can feel like Van Helsing or a bloodsucking vampire. Two teams of four players will fight to death, as they say, to the last drop of blood. But the winner is revealed on points only after the next fight, when players switch roles. People and vampires - there is an implacable war between them for a long time, I would like to say that under the sun, but as you know, vampires do not like to sunbathe. But we, people, they perceive as legitimate food, and we categorically do not want to put up with it. On this basis, differences occur, and one cannot say that the forces are radically outweighed in someone's favor. Representatives of each race have advantages, but also sin with flaws. People rely on the power of weapons: bows and crossbows, throwing shells, grenades with various effects, traps. But the near fight is given worse, so it is better not to let the sharp-toothed predators to themselves. Vampires, on the contrary, prefer close combat, because their weapons are fangs, claws and wings. They have incredible physical strength, and they prefer not to get involved with human weapons. To which need a team, it is clear that you are strong together. But as far as tactics are concerned, in order to embody it successfully, consider the characteristics of the characters. Vampires know how to climb the walls perfectly, fly, jump far, have tremendous power, but the capabilities of each are developed in different ratios. There are fast and light vampires who can bounce and beat the victim high; others huge and strong, scatter enemies to the side; still others grab the victim from the crowd and fly up with her. people have their own chips. They are divided into shooters of different types: archers, crossbowmen, mortar men. Accordingly, someone will become a scout, someone will support, well, and someone a sniper. When playing for people, get ready for shooting, long shooting, very, very long and intense shooting. To join and contribute to the development of war, you need to Nosgoth download, create a hero and find the rest of the team in the network. All know that every hero gradually acquires strength and dexterity. In other words, husbands and tempered in constant battles. You can't go wrong if you assume a similar situation in iPlayer Nosgoth. To upgrade your personality, take part in battles and get an artifact that will increase your class. As you complete missions, you earn a currency for which you can buy a lot of useful things: skills, equipment, uniforms. There are also real money that will accelerate the process of accumulating experience, skills, income. You can also buy boosts and skins, but such purchases are not mandatory, and you can do without them. Plus Nosgoth can surely be called the presence of relative equality of players. That is, experienced gamers will not be able to attack and destroy beginners. Pohod dynamics of the plot, beautiful graphics, exciting fights, a variety of free features. But most importantly, it is a wonderfully executed idea of ​​a vampire theme. Since the vampires have become quite a hackneyed topic, developers can be commended for the original approach.